Once upon a time there was a man who had 10 cows and 100 children. All his children needed cows. “Give me a cow so I can feed my many children”, said one. “Give me, for I am your newest child and I have nothing”. “My friends are leaving me for others who are richer”, said another. There were school fees, hospital bills, repairs; - many needs. Few cows. I could take all my cows and prepare a big feast for my children - but they would be hungry again tomorrow. If I say “yes” to one, then I must say “no” to another, for there is not enough to go around. Then he had an idea! Instead of taking from the cows, his children could give to them. Some had grass they could give. One had wood, another had rope- they could build an enclosure to protect them at night. Some had knowledge of how to help the sick and the weak ones. Some could be with them to watch over them. At first his children were unhappy. But little as they had, they gave what they could, and the herd began to grow. The cows became healthy and sleek. Their milk was good and nourishing. Before long, their cows became the ones that everyone wanted to buy. They kept some and sold some, and the herd kept increasing. Now I can be in peace, thought the old man - if my children learn how to give what little they can, and to share what they have, and to take care of what they have, then there will always be enough. “What are your strengths? Your gifts? Your ministries?”, we ask. “We need money - then our ministry will be to have a church that can give education, health care and worship,” was the reply. How to bless and empower without discouragement and without continuing to foster an unhealthy dependency? 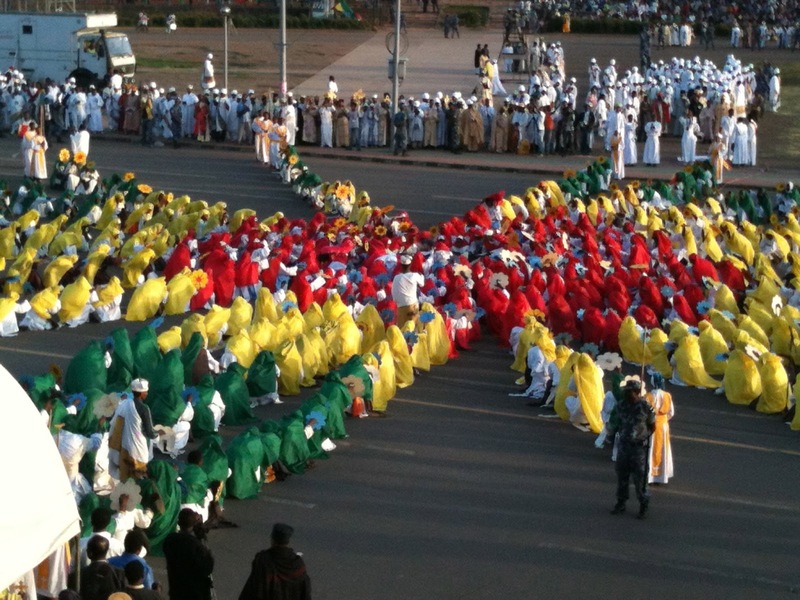 How to build a fully African church in its support, propagation, liturgy and government? The Confirmation service the next morning was held under a tree - the church had been destroyed by recent flooding (not the only one to have been lost to the floods in Gambella this rainy season). Grant preached on Matthew 28:16-20, the so-called Great Commission: a story about eleven disciples, some of them doubting, sent to change the world. They had no church buildings (or clinics, or schools) - nothing but the power and the Presence of Jesus - with them always: the same Jesus who had died on the cross at the hands of the religious and political authorities of his day, now claims to have all authority. Grant then laid hands on about forty Confirmands (most of them named Martha, it seemed) and commissioned them to go into the world with the message of God’s love in the power of the Spirit. The first weeks in Gambella have been intense. After a beautiful service of Installation in Addis, with Ethiopian church leaders, international visitors and members of the diplomatic community as witnesses, we then headed to Part II. At the Gambella Installation there were a few more religious and political leaders - but mostly members of the churches from all around the Gambella region - some had travelled for two days to get there. Grant spoke to them about his hopes for this Diocesan Area - that they would be self-expanding (well, they do this already), self-governing (their next bishop should be an African! ), self-supporting (they need to move away on depending on outsiders for everything) and self-theologizing (they need to be able to discern God’s will for God’s mission in this place). Not everyone liked these ideas, Grant soon discovered - especially the self-governing part: a small ethnic group worried that this would mean that the next bishop would be from a different ethnic group. Their fears may or may not be well-founded, but they are fears nonetheless. So they must be taken seriously - but they must also be healed by the perfect love of Jesus who casts out all fear. The self-supporting bit, well it just seemed to them to be impossible. In the meantime, we will continue with the self-expanding part (they can plant churches, these folks), and begin work on the self-theologizing - every month when they come to be paid, they will receive two days of theological education, something they have had little of, but which they yearn for. Come Holy Spirit - guide and empower us! Language learning is about sharing and relationship. Our Amharic class, is self- dubbed, ‘The Ferenge Show’ because of the particular giftedness we Ferenge (‘foreigners’) seem to have for causing our Ethiopian friends to weep with laughter. In fact, we love nothing better than to share stories of our latest spectacular failures in communication. One classmate left her egg seller bewildered when she asked for, “One dozen frogs, please”, and gave the man who grabbed her arm on the street a totally wrong impression when she responded, “Ow!” - which is the Amharic word for “Yes!” Together we are discovering, in language, an interwoven tapestry of communication and culture, meaning and relationship. It was the story of the Afar that brought this home most vividly to me. Imagine with me that you are in the tribal court of the Afar, listening with the elders gathered to hear a case. Arguments and counter arguments are put forth. Then everyone is quiet. In poetry, the elder designate stands and sings the two sides of the case. Only now is it legitimate. Only now the arguments, presented in song, poetry and metaphor, are ready to be decided upon. The Afar dictionary is a fraction of the thickness of those of other languages. But one sentence in metaphor, conveys the essence of an entire story, culturally nuanced to convey much more than the spoken word. Leaders must undergo years of training in eloquence before being given the honour and responsibility of judging the words of another. When we learn a language, we get to learn a people. Imagine an event which has elements of the Rose Bowl Parade, followed by a victory celebration on the street after your team has won the Stanley Cup or the Super Bowl, combined with elements of Good Friday and Ash Wednesday all rolled into one. 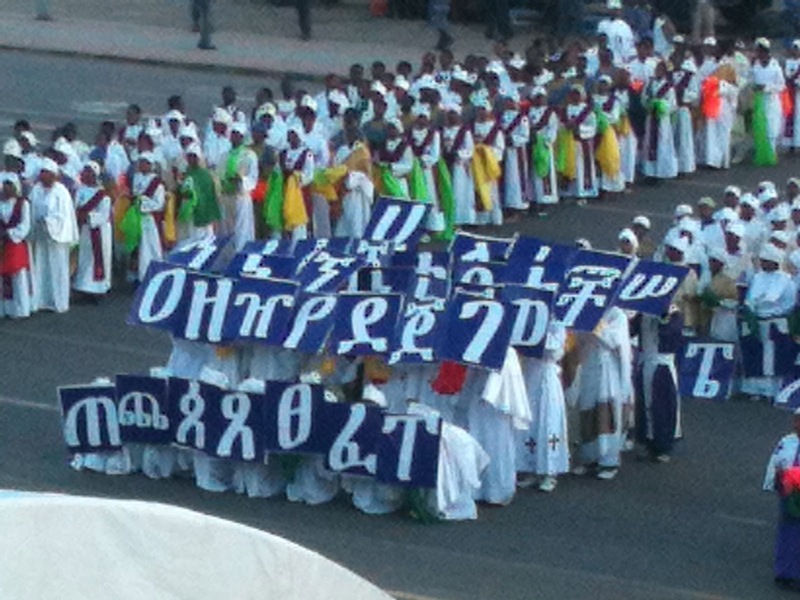 It may be hard to imagine, but such is the annual celebration of ‘Meskel’ (Amharic for ‘cross’), the feast of the finding of the true cross. The feast is a public holiday. 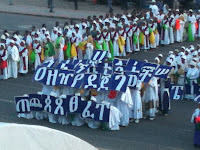 In the Ethiopian capital, Addis Ababa, close to 300,000 people gather at Meskel Square every Sept 27 to watch marching bands, mass choirs and floats on which the story of the conversion of the Roman Emperor Constantine (his vision of a glowing cross in the sky and a voice declaring “in this sign is victory”) is portrayed. His mother, Queen Helena searching through Jerusalem for the true cross, is directed by the smoke from incense offered with her prayers, to the correct place to dig for the relic. The climax of the festivities comes as the sun sets. 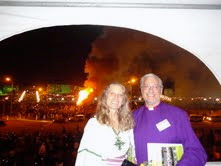 As thousands of candles are lit, the Patriarch lights the Meskel fire - a huge Christmas tree-looking pyre called a “Demera.” As the night goes on thousands of smaller Demera bonfires are lit all over the city (and all over the rest of the country for that matter). But events in the square are not over. Just as it was believed that the wood of the cross had miraculous healing power, so the Orthodox believe that the ashes of the Demera, blessed and lit by the Patriarch, will bring a blessing. And so, as the fire of the Demera dies down, thousands of people run to gather the ashes and mark their foreheads. We escaped the crush, but only just. 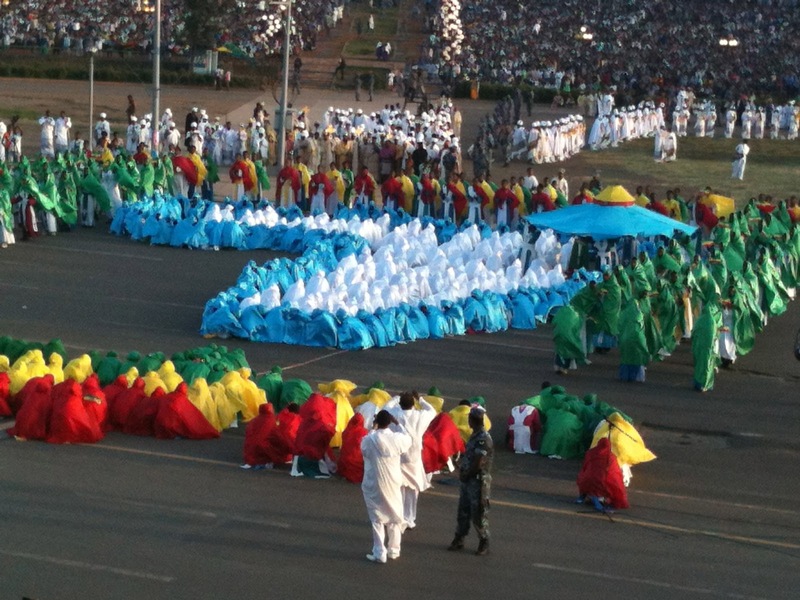 Meskel is a fascinating combination of religious, cultural and political ideas. The church in this country is ancient (at least 1,600 years) and it has shaped many cultural realities. The church and the state have also been closely linked (perhaps, at times, too closely linked). A confusion between the cross as a sign of victory (over evil) and the cross as an imperial weapon for victory betrays this close, and not always healthy, connection. I worry about the message of the cross as a weapon, and the obvious connections between political and religious power also worry me. 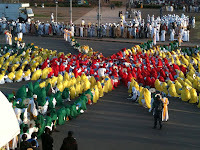 At the same time, the devotion and piety of the ordinary people cannot be denied or ignored. They know that the cross has some kind of power. The desire to retrieve the Demera ashes and just the sheer numbers of people at this event reveal a love for the story of the cross. And, thankfully, another reading of the message of the cross was delivered on this day by Abune Nathaniel, the acting Patriarch (Abune Paulos died just before we arrived in Ethiopia). His short message was that the cross brings peace. Jesus’ death for us achieved reconciliation with God and pointed to reconciliation between people and people groups. It was a message much needed in a country still recovering from years of totalitarian rule under the Marxist Derg which only came to an end in 1991, as well as massive poverty, and recurrent famine. 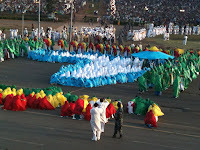 Ethiopia is an island surrounded by unstable and often war-torn neighbours. Internal issues and external pressures seem to conspire against the poor. In a country with 80 distinct ethnic groups each with their own languages and cultures, it is tempting to blame the people down the road or the people in the capital city, or the people in the next district, or country. But the cross, said the Patriarch, brings peace, a peace not yet fully realized, but promised none the less, and seen in many and various ways as God works in this amazing place. He is the head of his body the church.